India and Sri Lanka have advanced final talks to operate an airport near Chinese Belt and Road Outpost, a multi-million dollar Chinese initiative, according to the Sri Lankan Civil Aviation Minister. “It was during this time India came up with a proposal,” Siripala said. 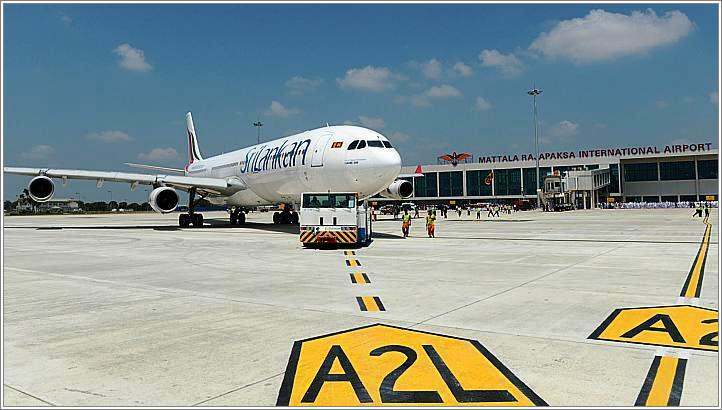 “They were ready for a joint venture with the Airport and Aviation Services Limited,” he added, referring to the state-run company that runs Sri Lanka’s main airport in the capital Colombo and the one in the south, in Mattala. India and Sri Lanka share a strong cultural and historical background and is expecting growth influx in tourist exchange owing to the expansion. Sri Lanka is expecting one million tourists from India by 2020. The town of Hambantota sits near one of the world’s busiest shipping lanes and is an important part of the Belt and Road initiative, aimed at building trade and transport links across Asia and beyond to Europe. China runs the seaport with a 99-year lease and was planning to expand its footprint in the area with the refinery, which would be Sri Lanka’s largest, and an investment zone of about 6,000 hectares (15,000 acres). Beijing’s projects, backed by loans extended by the Chinese government and initiated by a previous Sri Lankan government, have faced widespread opposition in Sri Lanka.Local residents facing eviction to make way for the projects have staged numerous protests. Other critics say the Sri Lankan government signed up for unnecessary and loss-making projects, pushing the country into long-term indebtedness. Reuters reported that there was no immediate response from the Indian foreign ministry to a request for comment on the airport deal. The initial investment would be USD 293 million, of which India will provide 70 percent on a 40-year lease, according to a Sri Lankan cabinet paper reviewed by Reuters that details the Indian plan to make the airport viable. The airport, built at a cost of USD 253 million by China, which also provided $230 million of funding, gets one flight a day, from Dubai, and has been dubbed the world’s emptiest airport for its long, empty corridors. The Indian source said New Delhi would allow Sri Lanka to determine the size of the Indian stake in the airport venture and whether it would involve state or private companies. However, the move is seeing some amount of protest from opposition members in Sri Lanka. Siripala, the aviation minister, said any deal to give India the right to manage the airport was purely commercial and would not compromise Sri Lanka’s security interests.